We interviewed Lexie Joy Bryson, Business Development Manager at Information Services Group on her experience and thoughts on women in tech. As a business consultant my role involves assessing a client’s existing IT portfolio, identifying business change requirements and developing ‘fit for purpose’ strategies to implement full scale change and digitisation in today’s tech-enabled world. 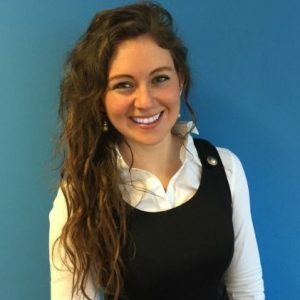 Having delivered a wide range of projects across multiple industries, I have recently transitioned to a new role as business development manager, where I look after the provider relations side of the business, helping to strengthen existing relationships and build new ones in order to generate new business and opportunities. We live in exciting times. Every business is going through transformation, and a career in technology enables me to be part of that journey, and to use the creative side of my brain to question how things can be done differently. For a recent UK public sector client, I assessed the current state and designed the future operating model for one of their largest transactions, in a highly regulated environment. I was lucky to see the process through to implementation, which resulted in a 60% channel shift from contact centre calls to online reporting. This saved thousands of manhours, allowing resources to invest time elsewhere, and greatly improved the customer experience. It’s outcomes like this that make a career in tech extremely rewarding- to see a process you designed implemented and really make a difference to people’s everyday lives. No. To be honest, I had no idea what I wanted to do when I was at school – it still amazes me that you are pressured into choosing a career at such a young age! I decided to study international business with a key focus on economics, as it would present me with a wide range of opportunities upon graduating. Prior to my current role I worked at Shell in the decommissioning of oil and gas infrastructure for 3 years. Decommissioning over on the UK continental shelf alone is estimated to cost around £60 billion, so we were always looking to leverage both new and existing technologies to do things smarter, faster and cheaper! Women certainly can have an aptitude for IT and tech, so given how few are currently in the industry it is obvious that there is a vast untapped potential. It’s difficult to blame the industry itself, though, given the low uptake for directly applicable degree courses. Yes, I do, it definitely has a reputation for being a man’s world! I remember when I was at school I had a very negative perception of tech- I thought computer science was boring, nerdy and very much for boys! This negative perception needs to change, and more needs to be done to attract girls into STEM subjects at school. Otherwise, women risk losing the opportunity to influence and shape the future of modern day society. As previously indicated, I think that there is a misconception of what a career in technology really is, especially amongst younger girls. Communication is key, and the messaging needs to be framed and associated with things that influence their everyday lives. For example, how many younger girls use social media applications such as Facebook, etc.? Also, it would be beneficial for women to gain exposure at career fairs and to hear success stories and examples from women in technology-related roles. The world as we know it is changing, but statistics speak for themselves- only 17% of employees in the UK tech sector are women! In terms of barriers, a lack of role models in the industry certainly doesn’t help. It’s neither encouraging or inspiring when you apply to join a firm as a young, ambitious woman and all the representatives on the leadership team are men! Tech is generally a demanding career that requires high levels of training and skills, but also has the rewards to make the effort worthwhile. Encouraging more women into STEM subjects in secondary and tertiary education is the first obvious step. Also, tech organisations should provide more opportunities for girls who are still at school to take work placements over school holidays. We recently ran a few work experience programs for young girls at ISG, where we took them on board for a few weeks and provided them with the opportunity to work alongside some of our consultants on real IT projects. The feedback was very positive and some of them are already looking to join us in the future! Beyond that, encouraging female role models in industry can only be a good thing. We need more events across the UK that encourage collaboration, where women in leadership positions share their experience, to inspire others and understand the art of the possible.